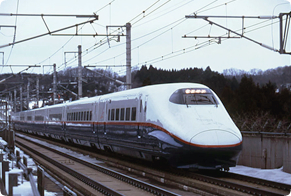 Joetsu Shinkansen service began in 1982, linking the Pacific seaboard side of Honshu with the coast bordering the Sea of Japan. Departing from Tokyo and traveling past Takasaki, you pass the Echigo and Mikuni Mountain Ranges, which yield a panorama of rice fields before arriving in Niigata, one of the most prominent rice-growing areas of Japan. In 1990, Gala-Yuzawa Station in Niigata Prefecture opened seasonally to provide direct ski resort service, and each winter, the trains are filled with the merry sounds of skiers. 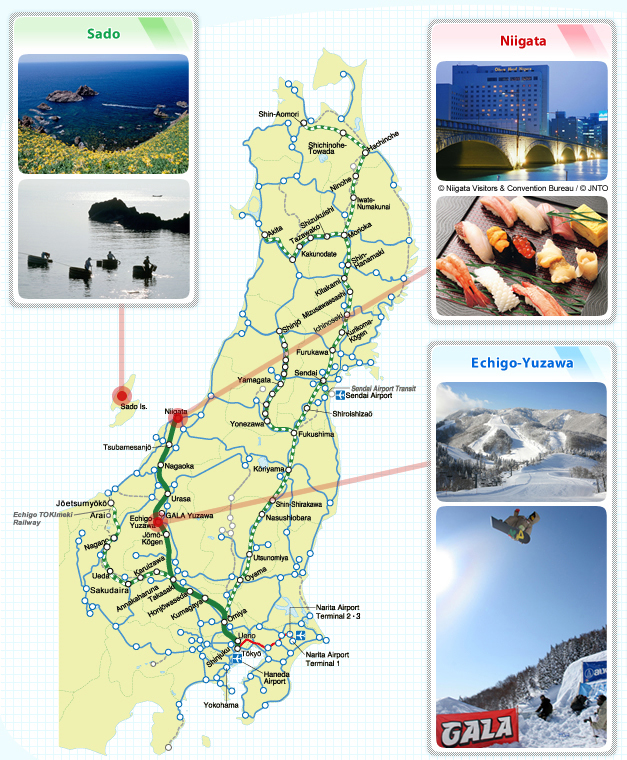 Service is extended to Gala-Yuzawa Station during the ski season. Notes: Some runs may include 16 cars. GranClass cars on Toki and Tanigawa trains provide seating but there are no attendants or on-board amenities such as snacks or beverages. 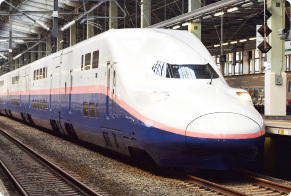 Access: Take the Joetsu Shinkansen to Echigo-Yuzawa Station. 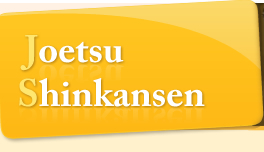 Access: Take the Joetsu Shinkansen to Niigata Station. Sado Island can be reached from Niigata Port in about 60 minutes by jetfoil. Most of the island is designated as national or prefectural parkland, preserving the beautiful natural scenery. A special treat to enjoy is the old-fashioned tarai boats, essentially washtubs used for boats, as well as the ocean views. A visit to the old gold mine is another attraction, where visitors take a trip back in time when Sado was known as the Island of Yellow Gold. 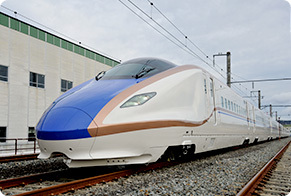 Access:Take the Joetsu Shinkansen to Niigata Station, then transfer to the Sado jetfoil, about a 60-minute marine trip.